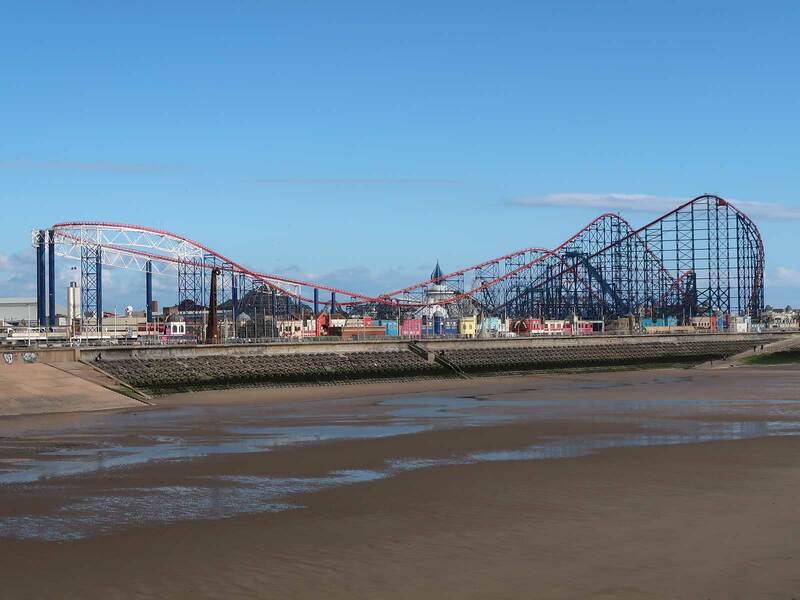 In January of this year, management at Blackpool Pleasure Beach abruptly demolished the classic Wild Mouse. The ride was easily the best of the four wooden mice in operation worldwide, and the only one in the northern hemisphere, and unsurprisingly there was a significant outcry both from members of the enthusiast community and from the wider public. The loss was made all the worse by the fact that it came without any advance warning, meaning that those after a final spin or two on a childhood favourite were left bereft. Part of me wanted to cut the park out of my trip plans this year despite the installation of a new coaster, as I didn't want to give my hard-earned money to a business treating its heritage (and long-term customers) with such callous disregard. At the same time however I had to acknowledge the fact that there were still four wood coasters in the park that Megan had yet to experience, and events had shown that it was entirely possible for any of them to meet the wrecking ball at any time. In the end my compromise with myself was to exchange Tesco Clubcard tokens for admission, reducing my financial outlay to an absolute minimum. The only unavoidable cost for the visit was parking. I decided it was worth investing £15 for a space in the premium lot, and lady luck granted me a spot less than fifty metres from the main entrance. The weather today was definitely not ideal. Light rain in the early hours became progressively heavier over the course of the morning and early afternoon, only burning off for the last hour of our visit. On the positive side, the conditions ensured short queues; we managed twenty-two rides over the course of the eight hour operating day, and probably would have gotten through thirty if we hadn't stopped for a leisurely lunch. All but one of the attractions in the area remained operational throughout; the only miss was the spinning coaster at nearby South Pier that was out of service due to high winds. 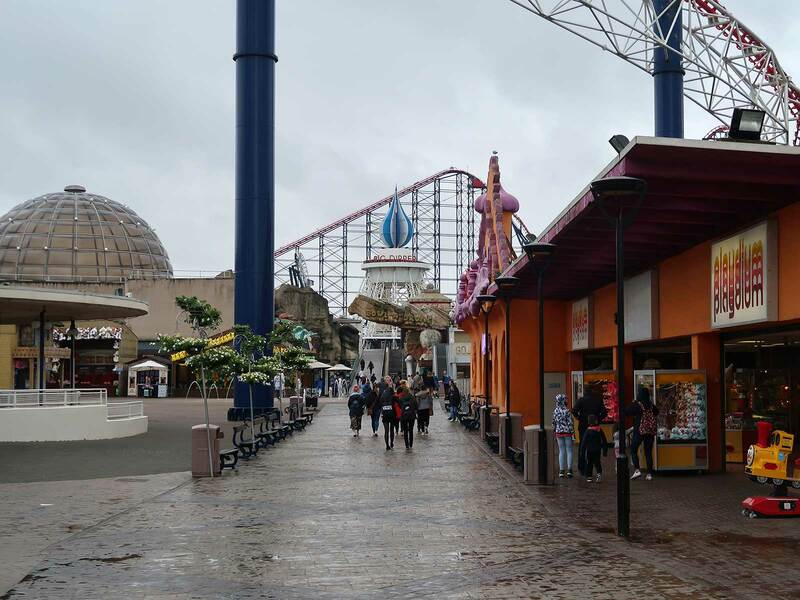 When I first visited Blackpool Pleasure Beach way back in 2002 there was no charge for admission and there were several entrance routes. Sadly that changed for the 2009 season; nowadays all access is via a consolidated airport-style security checkpoint at the north end of the park. The metal detectors appear to be primarily for security theatre; Megan set hers off but was allowed through without further checking because "it was probably your glasses". I take the view that mandatory checkpoints in public places amount to letting the terrorists win; I wonder just how many times I've had to take out my mobile phone and camera over the last few years. As ever we decided to begin our visit with the new coaster. A moderate line had formed in front of the entrance to Icon (#2444), and we joined it just a few metres away from the Laughing Man, a profoundly annoying animatronic sideshow dating from 1935. This abomination was coin operated at one point in its life, but now runs continuously, presumably as a way of dispersing guests that might otherwise congregate in the area. The twenty minutes we spent standing right next to recorded uproarious laughter were not the highlight of our day; I'd urge anyone retracing our steps to bring earplugs in the interests of their own mental wellbeing. "Get ready for the rush of the Revolution. With its wicked acceleration the train is launched out of the station and speeds straight for the gigantic loop. Just when you think it’s over you are launched backwards to relive the incredible g-force all over again!" There's no doubt that I'm getting grumpier as I get older, but I have to say that prevarication in marketing annoys me, not least because it tends to get parroted around (or worse yet embellished) by the chattering classes. Three years ago the media here in Ireland had a field day over the world's first inverted wood coaster (if only! ), and just last month there were a slew of stories circulating that labelled Steel Vengeance as the world's tallest coaster, the word "hybrid" having conveniently disappeared. The obvious conclusion is that news media cannot be bothered to report accurately, and thus are complicit in the dumbing down of our society. But I digress. The loading station has been placed parallel to the Grand Prix antique cars in a space formerly occupied by a midway. The design was clearly constrained by available space; there is enough room for four people to stand at each air gate, but the queue approaches from the back and it isn't possible for oncoming guests to see when there are empty spaces towards the front. Today the atmospheric music had to be paused every now and then so that the operators could ask people to move forward. I preferred this approach to to the scourge of assigned seating, though I can't help but wonder if there might be a better solution; perhaps allowing a train load of people into the station at a time (first come/first served) might avoid congestion while keeping capacity high? In theory that approach might also allow for dedicated front and back queues too. The train rolls out of the station onto a launch track and stops for a number of seconds. The acceleration when it comes is modest, being very much in family coaster territory, though it is enough to push the five car train over a twenty-five metre high top hat with some speed to spare. The track then passes under the lift hill of the Big One and enters a series of banked turns that weave their way around (and through) Big Dipper and Steeplechase. A zero gravity roll and mist-filled tunnel lead to a somewhat better launch, a hangtime-filled inversion, and a whole series of dramatic side-to-side turns. The last few are particularly forceful, generating sensations that are not altogether unlike those produced by a Zamperla Disko. Icon isn't a bad ride by any means, though those after an extreme thrill will be disappointed. The experience felt a little too homogenous for my liking, relying too much on side-to-side turns; a little more variety in the layout would have improved things immeasurably. The ride remains a worthy addition to the park (and I'm not using that phrase pejoratively) but the four laps I completed today were ample; I won't be making a special effort to return to it in the near future. The benchmark ride for Mack launched coasters remains Helix, which is in a league of its own, and I still think Nemesis is the best coaster in the UK. Our next stop was at Steeplechase, an unusual coaster with three parallel tracks traversed by horse-shaped vehicles. The ride has been the only one of its type for over two decades following the closure of an American equivalent at the end of 1996, and while that may soon change the experience is, for the moment at least, unique. The red track was out of service today, a mild embuggerance for Megan, but the other two were running pretty much as I remembered them from my last rides way back in 2002; enjoyable if somewhat jarring due to limited cornering ability. The green track was very noticeably faster than the yellow today; the reader is invited (and actively encouraged) to come up with their own aphorism involving horses and lubricants. Our next stop was at Revolution, an increasingly rare example of the Launched Loop from Arrow Dynamics. Eight versions were produced in the late seventies and early eighties. The first three premiered in 1977 at Boardwalk and Baseball, Kings Island, and Six Flags New England. The next year two interlocking versions were set up at Six Flags Great Adventure, where they operated in tandem for eight years. One of those tracks lives on as Diamond Back, while the other was scrapped following a five year stint at Six Flags America. The final two opened in 1980; a version at Tokyo Dome City that lasted just five seasons, and another at Magic Springs & Crystal Falls that was sold on after ten, eventually rematerialising as Sidewinder. The machine at Blackpool was the sixth off the production line, premiering in 1979 in a striking red and white colour scheme. Nowadays it wears a much more subtle silver hue, though many other aspects of the experience are as they would have been thirty-eight years ago, not least a recording that says that "you are about to experience the most exciting and thrilling ride of your life" and a second repeated ad nauseam reminding guests to stay behind the yellow line. The ride experience today was little short of disastrous; the train began to shudder badly during the initial acceleration, and a series of slams in the loop were transferred directly to my shoulders and upper body by the unforgiving restraint design. We decided to splurge on our on-ride photo for its sheer hilarity. With the Arrow coasters (fortunately) out of the way we headed for Avalanche. 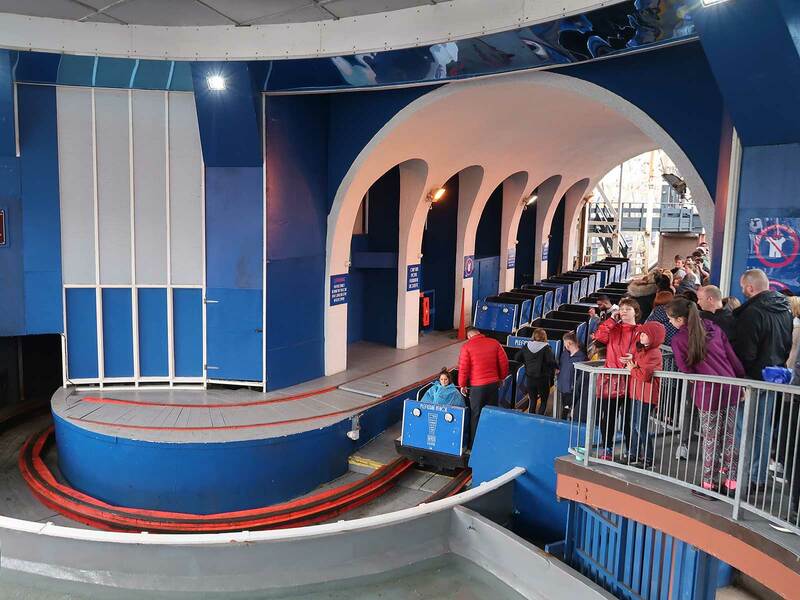 I've always had a soft spot for bobsled coasters of all kinds, and though the Blackpool model is the shortest of the six Mack models it remains a lively and forceful ride that I'd argue to be one of the best in the park. The hardware limits the layout to a mix of helices, but that isn't a problem with a design that builds speed all the way from the top of the lift to the brake run. It's a huge shame that the last new bobsled opened over fifteen years ago; if any park owners are reading this then I'd strongly encourage you to look at acquiring the version removed from Kobe Portopialand which was last reported to be in storage in Italy. 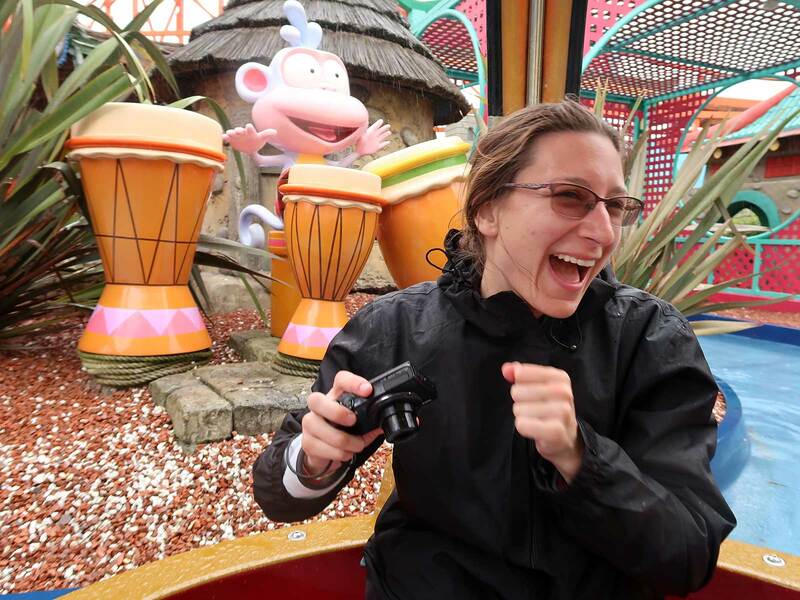 Our next stop was Dora's World Voyage, a slow-moving boat ride that can be thought of as a very basic outdoor equivalent of Disney's It's a small world. Our tour brought us past static cartoon scenery from France, Russia, China, and Tanzania to the accompaniment of a repetitive song teaching us how to say hello in the local languages. Megan liked this rather more than I did; personally I felt it could have been improved with a special soundtrack for adult only groups, perhaps adapted from the Book of Mormon. Viacom might not approve of that kind of alteration, but it might still be worth it. We took advantage of a break in the weather to appreciate Nickelodeon Streak, an eighty-five year old classic that ran for over seventy years with no restraints whatsoever. Changing health and safety regulations have resulted in the addition of lap bars, though I can report that they have no real impact on the ride experience which remains lively and enjoyable, if not one likely to rearrange top ten lists. The layout for the most part follows the eastern boundary of the park, coming within seventy metres of the nearest house; one presumes that the residents there have good sound insulation on their windows. I wasn't overly fond of the orange-coloured track and luminous green train, which make for a rather tacky combination, but one probably shouldn't expect anything else at a place like Blackpool. Our next stop was at Wallace & Gromit's Thrill-O-Matic, a dark ride added to the park for the 2013 season in place of the former Gold Mine. Two car trains have been designed to look like Wallace's slippers, and these negotiate a variety of scenes from five of the seven movies: A Grand Day Out, The Wrong Trousers, A Close Shave, The Curse of the Were-Rabbit and A Matter of Loaf and Death. An intimate knowledge of the Aardman comic duo is not a prerequisite to enjoy what is a good family-friendly attraction, though it certainly helps explain certain scenes. We decided to pass on the cheese-flavoured rock on sale in the gift shop. The same area of the park also features the River Caves, a superb dark ride dating from 1905 that I'd somehow never gotten around to experiencing for myself. Guests board small boats that float through an elaborate set of scenes comprising a Chinese emperor, dinosaurs, the depths of the ocean, Inca civilisation, and finally three present day tourist destinations: the Blue Grotto of Capri, the Valley of the Kings in Egypt, and the temples of Angkor Wat in Cambodia. The scenery is mostly static, but the quality and scale of it is impressive, especially when you consider how old it is. That being said, there are two slightly strange features of the ride as it stands today that detract from the overall experience. The first is a sign at the entrance saying "Tunnel of Love", which I've since learned is a relic from when the ride made a brief appearance in an episode of Coronation Street. The second is a pointless three foot high lift and outdoor splashdown that serves no obvious purpose given that it terminates at the ride boarding platform. A larger descent into caves would make sense; a drop of this scale does not. The rain was falling quite heavily when we boarded Big Dipper, and as a result we didn't really get to appreciate the ride properly as we had to keep our eyes shut. The one interesting feature for me was the presence of four-bench trains, something I don't recall seeing anywhere else; I was expecting these to have problems cresting hills, but they managed well enough. We were hoping to ride a second time towards the end of the day, but found that it had closed thirty minutes before the sign at the entrance suggested that it would. After a quick food stop we decided it was time to endure Infusion, the Vekoma SLC that formerly operated at Pleasureland Southport. Perhaps we were lucky, but I can report that the ride quality was nowhere near as bad as expected, to the point that I could have gone back for a second lap. The installation certainly looks the part; I particularly liked an artificial waterfall effect set underneath one of the drops. At the exit we found a CoasterDynamix model of the layout with four-across trains, which set me wondering what the venerable five inversion layout might be like if manufactured by B&M (or, indeed, using Vekoma's latest fabrication technologies). Perhaps we'll find out some day. The most uncomfortable coaster in the park by a significant margin was the left hand lift on Grand National. There were powerful moments of airtime at each apex, but these were quickly forgotten as the train crashed into each drop with a brutality that made me question whether the wooden track had been reinforced with concrete. Our ride on the right hand track was somewhat better, though that might have been because we made a point of not ending up in a wheel seat, and neither of us felt like risking a third lap to confirm our suspicions. A recording in the station parroted the words "this is a wonderful ride" every few minutes, perhaps in a vain hope that people might actually believe a statement if it was repeated often enough. Our next hit was at the Ghost Train. In recent years there has been some debate in the enthusiast community about whether two dark rides built in the sixties by the Pretzel Corporation should be classified as roller coasters. Proponents of the theory point to the fact that Devil's Den and Haunted House have a lift hill and rely on gravity and momentum to complete the journey, and it is certainly true that this is the usual rule. Others ask where the line should be drawn, and the installation at Blackpool is a data point for this side of the argument, as it features a gravity driven drop and climb that is bigger than many coasters. The structure for this element isn't supported from below, and it visibly flexes every time a car passes over it. My take is that everyone can count what they like; for me a dark ride is still a dark ride. I enjoyed this one a lot, particularly the scene where we passed a number of skeletons riding bicycles. Our final stop was at the Alice Ride, described as an enchanting trip through the looking glass into Alice's Wonderland. The layout featured two brief outdoor sections with not very much to see, though the interior was much better, featuring brightly coloured mushrooms, chess pieces, playing cards, Humpty Dumpty, scenes from the Mad Hatter's tea party, and a whole bunch of book pages. The only slight oddity was the soundtrack, a thirty second loop taken from the seventies version of Charlie and the Chocolate Factory; one would have thought that a less recognisable tune would have been a better choice.